The idea of wearing a crop top may fill you with dread – exposing your stomach for the world to see can be daunting at the best of times. And it’s only made worse by the fact that we’re only just starting to experience what can be classed as decent weather here in the UK. That means we’ve had many more months of dreary dull weather than we’re used to, which may have understandably put many of us off going to the gym or starting to eat more healthily. The good news however is that 2013 has brought many new styles of crop top to the forefront of the fashion world so fears of showing off an un-toned tum are fast becoming a thing of the past. Here are 2013’s best crop top styles. If you’re a bit nervous about showing off so much of your stomach then this is the trend for you. It doesn’t matter if your crop top is a bit short if you team it with something high waist as this will instantly cover any problem areas. Celebrity fans of this style include Miley Cyrus, Solange Knowles and Jessica Alba. Copy their look by teaming your crop top with a high waist skater skirt for a glamorous occasion or a pair of high waist denim shorts for daytime casual. Check out the many styles of crop tops at Missguided.co.uk to stock up your wardrobe with the summer IT item. Another on-trend way to wear your crop tops this season is to match your whole outfit. That way, the attention is drawn to your entire look rather than simply your bare stomach. Floral patterns are huge for 2013 but that doesn’t mean they have to look girly and feminine. To add edge and attitude to your floral patterned crop top, choose a design that has a black background with spots of floral patterns dotted randomly and wear with a pair of killer spiked heels. You can wear a crop top and not bare any of your stomach if you don’t want to. Simply tuck the bottom of your crop top into a pair of tailored city shorts for a cool summer look. Choose your crop top in a neutral shade and match with brightly coloured city shorts. And if you’re feeling a bit braver you can un-tuck your crop top as the day goes on. It’s likely that you know the fashion rules when it comes to baring your skin – less is more, right? Well that’s exactly the motto behind the latest style of crop top. A long sleeved crop top will hide even more of your body so that only a sliver of your midsection is exposed. This can be a very striking look that works incredibly well for a more formal evening event. Another style to hit the catwalks this year is an oversized, box shaped crop top. A far cry from the figure hugging crop tops of the 1990’s, this crop top style hangs loosely over your midriff so you don’t have to worry about dieting or restricting your food intake while you’re wearing this item. So go on, tuck in to dessert and enjoy it. 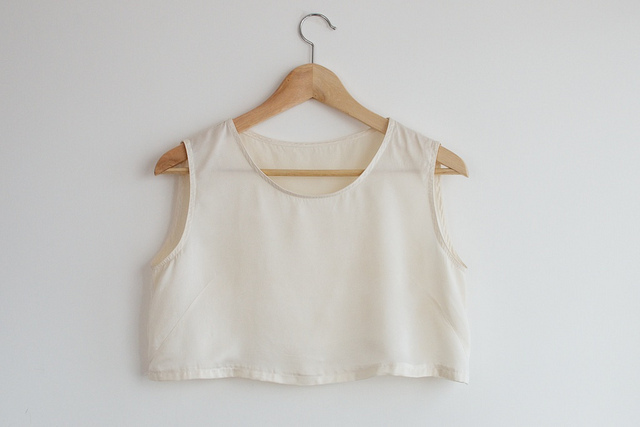 What style crop top will you invest in this summer?